T-130 - This stands for thread count. The thread count is the number of horizontal and vertical threads in one square inch of fabric. The higher the thread count the softer the pillowcase will feel. 55% Cotton 45% Polyester or Similar Blend - This might change slightly based on our manufacturing sources. 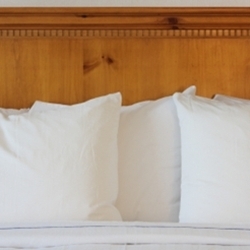 The exact style of pillowcases may vary slightly from order to order. The style depends on the manufacturing source at the time we purchase the items. These pillowcases are commonly purchased by camps, prisons, nursing homes, hospitals and other types of facilities. Institutional quality pillowcases. Some people also buy these for crafts. These are not recommended for screen printing. We suggest you purchase 100% cotton for screen printing. We do not recommend the 130 thread count for screen printing or heat press. Now Available! Order online or call to order over the phone.